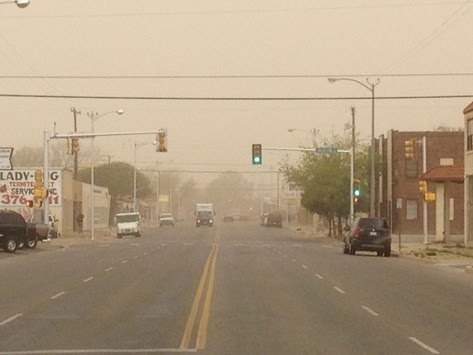 Strong northerly winds yesterday produced a dust storm over the southern High Plains. Photo above is from Amarillo, Texas. 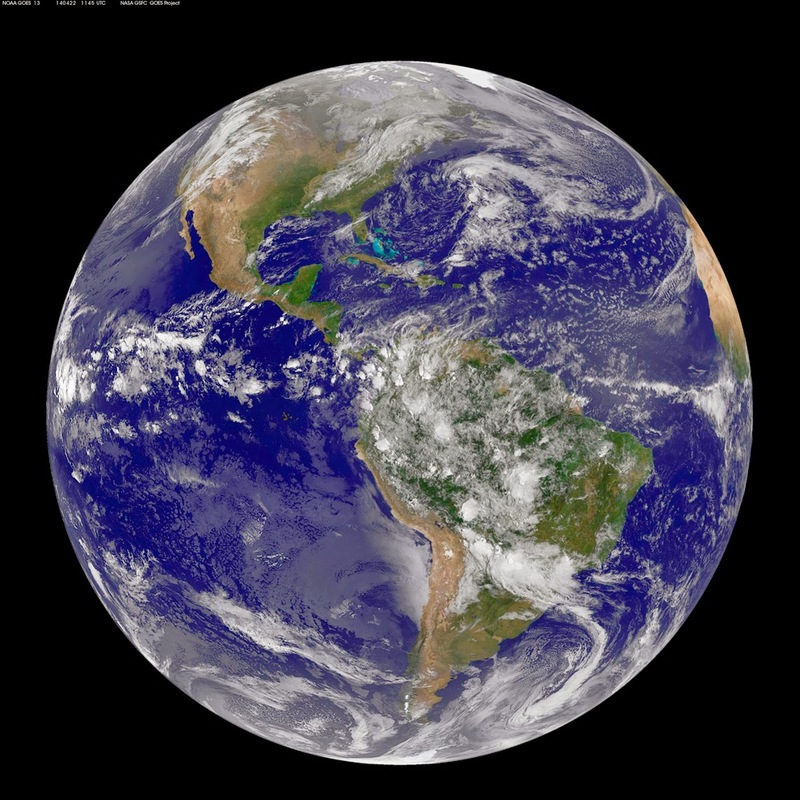 The dust is visible in the satellite image below - it is the solid area of gray-white that covers the Texas Panhandle and most of west-central Texas. This morning some of the dust has made it into southwestern New Mexico on strong easterly winds. 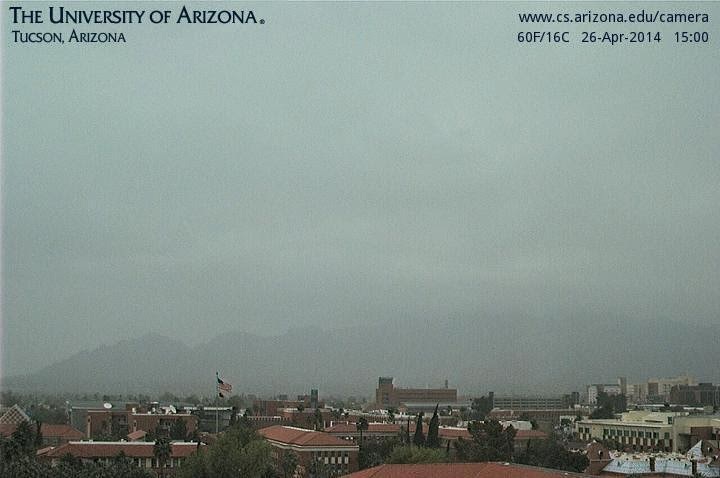 The remnants of the dust storm may make it to the Tucson metro area, as east winds will be on the increase here this afternoon into tomorrow. The surface plot below (for 8 am MST this morning) indicates that dust is being observed from El Paso west to the Arizona - New Mexico border. Surface pressures are much higher, both to the north and also to the east of Tucson. Edited to add: Below is the forecast of 10-m winds (from the early run of the WRF-NAM model at Atmo) that is valid at 9 am tomorrow morning (May 1st). The model forecasts very strong winds for the Tucson metro area during the early morning hours. The preliminary maps of severe thunderstorm reports for April 27th and 28th are shown above - well over 600 reports of severe events are indicated. A number of the tornadoes were destructive, producing many injuries and deaths. It is interesting, and perhaps worthy of study once final reports are documented, that supercells producing tornadoes were scattered from Nebraska to Alabama on Sunday, but were mostly confined to a narrow corridor across Mississippi and Alabama on Monday. Meanwhile, the large cyclone over the Central Plains has brought yet another late spring snowstorm to the northern Plains. 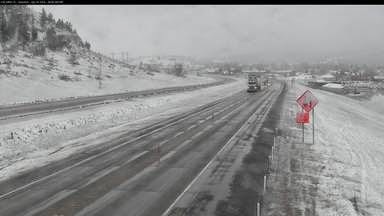 Web cam view below is from I-90 at Spearfish, South Dakota, in the northern Black Hills, this morning. Severe storms and tornadoes struck many places in the central US yesterday, with Arkansas being particularly hard hit. Severe storms are active again today (Monday, April 28th) a bit further to the east. Above image is from the NWS Brandon-Jackson, Mississippi, Doppler radar. There are numerous supercells occurring at this time across northeastern Louisiana and northern Mississippi. Severeal of these have produced tornadoes. There appear to be at least 5 supercells moving across northeastern Mississippi, with another 3 or 4 over northeastern Louisiana. View of Catalinas above is from 3 pm MST yesterday afternoon, as a rain shower was moving across the north part of town. Places at low elevations that had rain measured light amounts - here at house 0.04", the airport and Atmo 0.02", and DM just a trace. Best precipitation amounts occurred at higher elevations from the Catalinas northward. 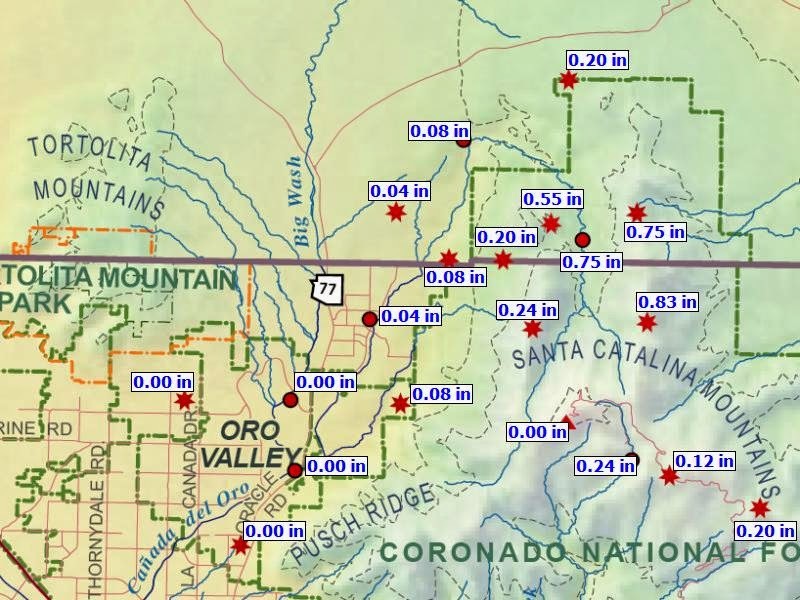 Map below shows 24-h rain amounts over the Catalinas, where some amounts reached over 0.75". The light amounts at low elevations evaporated pretty quickly, once the sun came out later in the afternoon. Across the ALERT network 37 of 92 sites reported rainfall - but the low resolution (0.04" is smallest amount measured) of the sensors means that coverage was actually higher than indicated. The winds were quite strong with gusts of 35 to 45 mph common across most of Arizona. Strongest gusts occurred over far southeast Arizona, where there was little precipitation. Douglas and Ft. Huachuca reported gusts to 55 mph and Safford had 54 mph. The airport had max gusts of 44 mph. The RAWS data feed apparently failed at mid-afternoon yesterday, so those data are not available this morning. Quite cool this morning for late April - low at house was 38F. The Tucson NWS currently has a variety of alerts and warnings out for southeastern Arizona - above graphic is from the NWS web page. 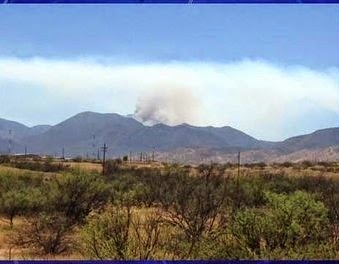 The emphasis is on strong winds, blowing dust, and wildfire hazards. The forecast also includes a 30% chance of rain at the airport today. At 7 am this morning gusty winds of 25 to 35 mph were common across much of the state, and the exposed RAWS site at Guthrie was already hitting 52 mph. Snow and rain were mostly confined to the north half of the state at sunrise. The 500 mb analysis for 12 UTC, from the current NAM model, indicates that a powerful vorticity maximum is centered over southern California. The upper-air sounding at San Diego indicated very strong wind speeds of 110 kts at 500 mb. The vorticity center will move across central to northern Arizona today, preceded by a strong Pacific cold front, that has already moved about half way across the state. The Tucson morning sounding from the NWS office on campus - below for 12 UTC from the SPC - shows very strong low-level winds reaching 50 kts at 700 mb. The PW is about half an inch. 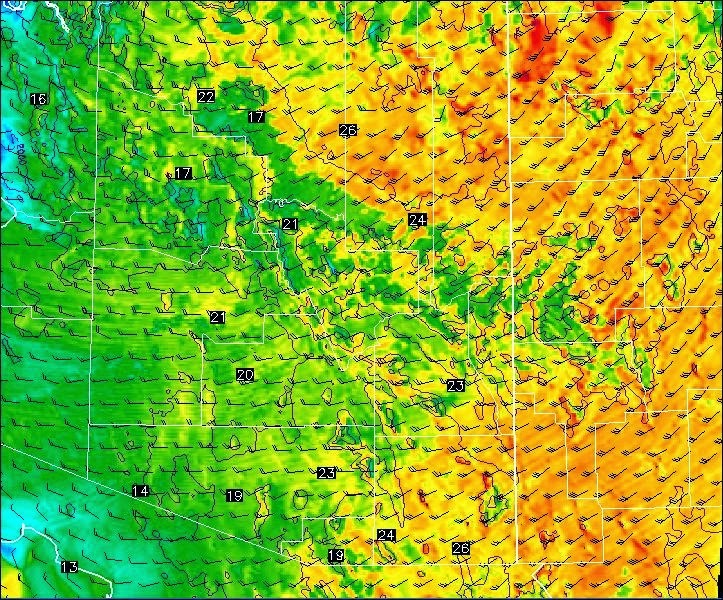 The early WRF-NAM forecast from Atmo continues to forecast strong winds across southern Arizona. The above, 10-m agl, forecast is valid at 11 am MST, when the model forecasts strongest winds across the Tucson metro area. The model also predicts PW amounts to peak across eastern Pima County around 11 am to noon - below is forecast of PW valid at 11 am - with amounts reaching to around three quarters of an inch. The model continues to forecast very sparse rainfall at low elevations and keeps measurable amounts mainly at high elevations, especially across the Rim country to the far north. At bottom is the early WRF-NAM forecast of total precipitation though midnight tonight. So, a turbulent day on tap for Arizona and the Southwest. The early WRF-NAM from Atmo forecasts several areas of light showers to affect portions of southeast Arizona tomorrow afternoon - forecast of composite radar echoes above is valid at 3 pm MST on Saturday the 26th. Winds are forecast to be strong as per previous post - the WRF forecasts a morning period of strong south-southwesterly winds, before the front moves through, and strong westerly winds in the afternoon. Forecast below is of 10-m winds valid at 3 pm tomorrow. As with the last several systems, the WRF forecasts rainfall, and some snow, primarily at high elevations over southeast Arizona (above graphic shows WRF-NAM rainfall totals forecast through 11 pm tomorrow night.. The new NWS NAM from this morning (below is forecast precipitation through 5 am Sunday morning) remains similar to the early forecast from Atmo, with most of southern Arizona remaining dry. However, precipitable water ahead of last weekend's system increased more than the models forecast, so the system coming in may produce more showers over lower elevations, if the strong southerly winds bring higher moisture into the state ahead of the Pacific cold front. Low temperature here at house this morning (Thursday, April 24th) was 40 F and it was noticeably cooler down along the Rillito at sunrise. A strong weather system will be crossing the Southwest Friday and Saturday, bringing some precipitation and strong gusty winds. The early runs of the WRF at Atmo this morning produced similar forecasts from both the WRF-NAM and the WRF-GFS. At this time both models produce some light showers over eastern Pima County Saturday evening, but only at the highest elevations. However, the 10-m winds forecast for Saturday are very strong behind the front - forecast above is from the WRF-NAM for 10-m winds at 3 pm MST on Saturday. The Pacific cold front moves eastward across Pima County during the early morning hours on Saturday, resulting in both the strong winds and much lower temperatures. Looks like dust is the most definite forecast at this time. Not welcome news for allergy suffers who are enduring yet another very bad sneeze season. 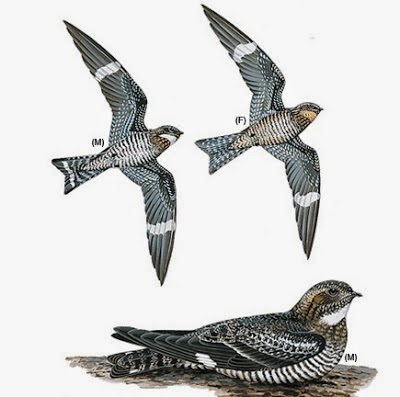 The night hawks (sometimes called bull bats) are back, swooping overhead at dusk last evening, hunting flying insects. This was first night that I've seen them. Their return this year is about two weeks earlier than last year. They are absolutely fascinating to watch, especially when they are flying just above rooftop level. 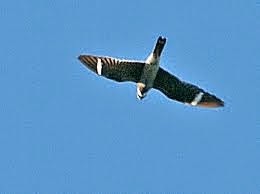 Neighbor reports that the night hawks were back last Thursday, the 17th. The small bats that hang out under the front porch vigas returned more than two weeks ago, also earlier than usual. Easter morning has dawned cool (45 F here at house), calm, and clear, after a day yesterday that produced more light showers and some thunderstorms. Here at the house there was a morning shower that produced another Trace. Most of the measurable rain was quite light and mainly to the east of Tucson, although there were some storms in central Pima County. Across the ALERT network there were 19 stations with rainfall, mostly higher elevation sites. There were also a couple of sites near the southern and western edges of the network with showers. 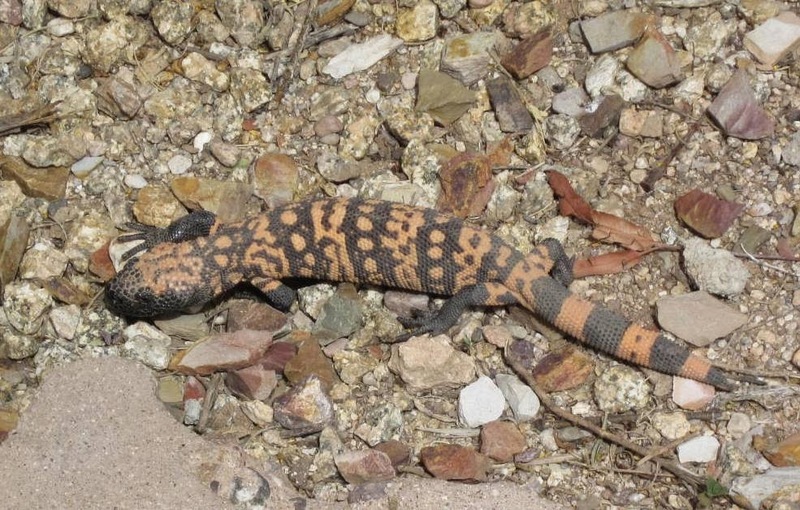 Only one site had more than 2/10s of an inch and that was on Redington Pass (0.28"). The RAWS stations across southeast Arizona almost all had light rain amounts, but Mt. Hopkins came in with 0.24". A thunderstorm near Douglas apparently produced hail up to 1 inch in diameter. There were quite a few showers, as well as some thunderstorms, over southeast Arizona yesterday afternoon, with some activity continuing through the night. Above is composite radar image from TUS a bit after 3 pm MST (Friday April 18th). Graphic below shows CG flashes detected from noon to 4 pm. Rainfall was confined mostly to higher elevations, with many low elevation sites, including here at house, reporting Traces. Above 5,000 ft MSL almost all of the RAWS stations reported measurable rainfall yesterday but amounts were light. Only 3 RAWS stations had 2/10" or more, with Columbine (Mt. Graham) reporting the most at 0.28"
A time series of GPS PW for the last 14 days at Atmo (above) shows values values for past few hours that are nearly double the maximum value during the last 2 weeks. There was a distinct smell of rain in the air this morning, which was quite pleasant after days of very low RHs. The graphic below shows CG lightning flashes detected from midnight to 6 am - most thunderstorm activity at sunrise was in eastern Cochise county and southwest New Mexico. However, there were storms moving northward from Sonora into central Pima County. The early run of the WRF-NAM at Atmo forecasts activity today to remain mostly to the south and east of the Tucson metro area; however, the early morning storms have developed further west than was forecast by the model. So, still some chance for storms across the metro area today. Graphic below is WRF-NAM forecast of rainfall through midnight tonight (Saturday, April 19th). The WRF-GFS forecasts appear considerably too dry for today, with hardly any activity over southeast Arizona. The upper low west of northern Baja is quite distinct this morning, having developed much as the forecast models predicted. The 13 UTC water vapor image above shows the system and the large area of thick, high clouds that has overspread the Southwest. The 12 UTC 500 mb analysis (below from NCAR RAL) indicates the 500 mb center west of San Diego, but apparently with two short-waves rotating around it. The NAM forecasts the vorticity maximum that is over northern Baja this morning to move rapidly northward across west-central Arizona today. The the main short wave moves across southern Arizona tomorrow and tomorrow night. The models forecast precipitable water (PW) to increase substantially today and the morning sounding for Tucson indicates about 1/2 an inch of PW - highest value in quite a while. The MIMIC PW product for 12 UTC this morning (below - from CIMSS at Univ. of Wisconsin) indcates PW values of around an inch or a bit more over the northern GoC and off northern Baja. So this event appears not to be as moisture-starved as the last few have been. The early WRF forecasts from Atmo are similar to yesterday; however, the GFS version is now considerably drier for southern Arizona than is the NAM version. Both versions forecast bands of high level showers/virga across Pima County today, with only scattered light showers reaching the surface. The graphic above shows the WRF-NAM forecast of accumulated precipitation through 11 pm MST tonight. Note the somewhat strange and distinct maximum over the Rincons. Below, is the same forecast, but for the period ending at 11 pm tomorrow night (Saturday, April 19th). The model forecasts what would be a nice precipitation event for southeastern Arizona, given that it is late April. Current NWS forecasts are for 30% chance of rain tomorrow at TUS, but 60% chances for Mt. Lemmon. The WRF forecasts definitely keep the more significant rain amounts at higher elevations. So, I'll be waiting to see if the gauge here at house catches anything with this system (last rainfall here was on March 1st).. Sprinkles Or More Numerous Showers? The early runs of the WRF model at Atmo last night have produced considerably different forecasts as another 500 mb short wave, in the southern branch of the flow, develops and moves across Arizona tomorrow and Saturday. Both the NAM and GFS bring a leading vorticity maxima north-northeastward across Arizona, followed by the main short wave on Saturday. Above graphic shows precipitation forecast by the WRF-NAM through 11 pm MST Friday night (18 April) and the same forecast from the WRF-GFS is shown below. The forecasts are quite different and leave the forecaster facing a dilemma - will the initial impact affect west-central Arizona or will it focus on southeast Arizona and the White Mountains? Note that the GFS version produces measurable rainfall over much of Pima County while the NAM version has forecast almost no rainfall for the county. Both versions forecast some additional, light showers on Saturday, mostly east of the Tucson metro area. The difference results primarily from the initial influx of increased moisture associated with the leading portion of the short wave. The models forecast the most significant showers to be associated with the leading part of the short wave and the GFS version also forecasts development of higher values of CAPE across southeast Arizona. The situation appears to be one in which the different models have minor differences in the forecasts of development of the short wave in the southern stream of the flow and of the northward advection of moisture as this feature takes shape. The situation is further complicated by the current dryness in the southern stream. I see that the new NWS NAM forecast run this morning shifts the main impact of this event to southeastern Arizona as the main part of the short wave passes. So each different model run seems to come up with slightly different forecasts. It appears to be a situation which will require careful monitoring of the PW tomorrow - so a tough forecast due to uncertainties that persist as the event draws near. The new WRF forecasts this morning should be interesting also. FYI... WFO Tucson recently re-drew their Fire Weather Zones (effective 4/1), so the "regular" Watch/Warning/Advisory maps should look better with Red Flag Warnings now. The new NWS Fire Weather Zones are shown below and Zone 152 is shaded orange-red to indicate a current Red Flag Warning. I assume that before the zones were re-defined a single zone covered all of southeastern Arizona, extending to the west of the Tucson Metro area. This led to some of the graphics on the NWS web page showing very large alerts for fire weather products, even if only a small portion of the area was impacted. 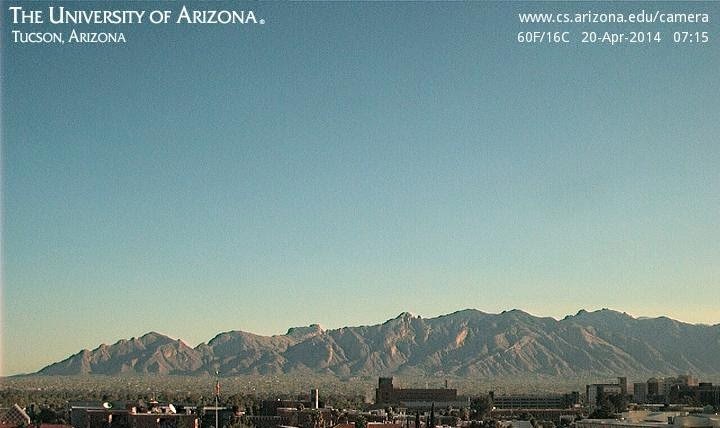 So, with the new zones, the home page of the NWS at Tucson indicates the above, i.e., a Red Flag Warning for Zone 152. A click on the "Detailed Hazards" tab is still needed to view the much smaller, actual area (below) that is under the Red Flag Warning. As the comment stated, the new zones do indeed reduce the extent of the warning on the NWS home page, but continue to indicate entire zones under the warning. It is not clear why the graphics used by NWS smear the details of some products on the main page that most users see first, and sometimes last. Note that this morning's NWS "Weather Story" does highlight the details of today's Red Flag Warning, and this feature catches the user's eye much better than does the detailed hazards tab. 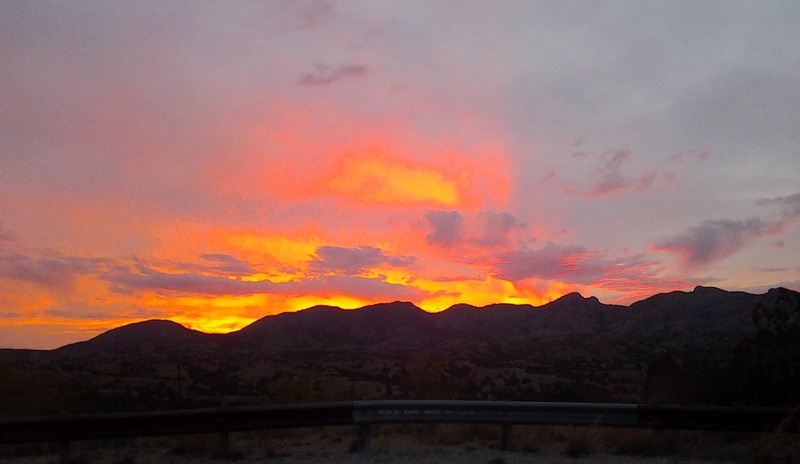 We were out northwest of Sonoita (almost directly downwind from Mt. Wrightson) this afternoon and it was very windy. While gusts around and over 30 mph were common today, I observed a few gusts early this afternoon that I estimate were in the 50 to 60 mph range. I see in the paper this morning (Sunday) that the flight performance of the USAF Thunderbirds was cancelled yesterday at DM due to the strong winds. Hi Bob! I’ve been in KC for the past three years, but keep caught up on TUS weather via your blog. I see you noticed the low TD/RH yesterday as well. I placed a comment on NWS Tucson’s Web Page and got this response.. it also appears some others noticed as well! From TUS NWS (Facebook?) below. NWS seems to be saying the Vaisala RH sensor, in combo with ASOS software, can produce questionable results at low relative humidities. Sorry for the small font - can't seem to get it larger. 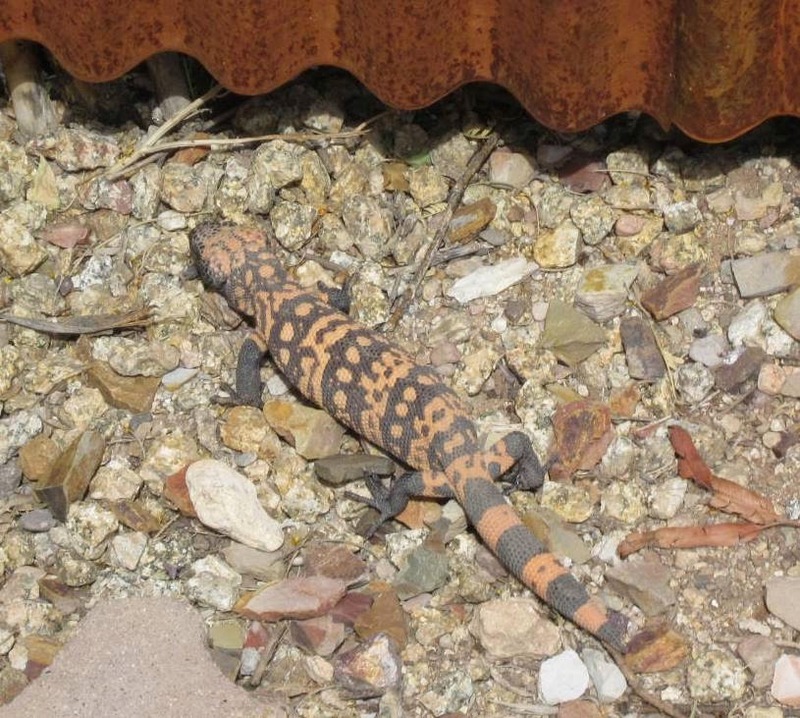 A Gila Monster wandered through the back yard at midday today. 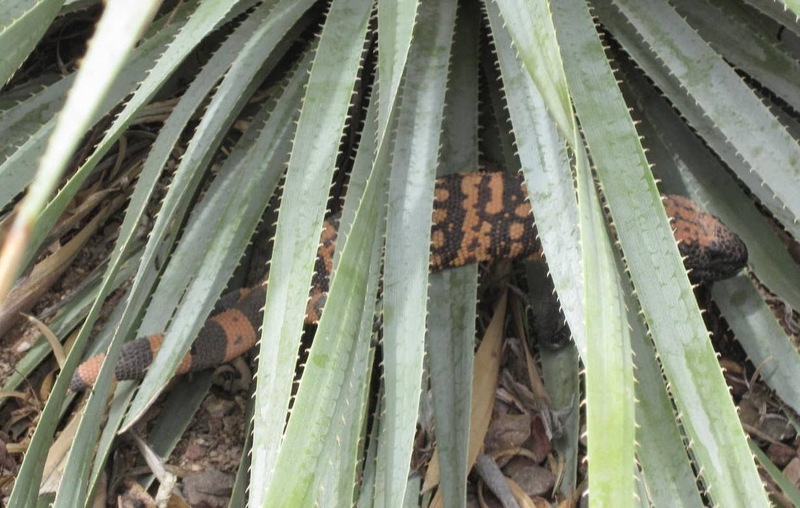 Only the second one I've seen in the "wild." Surface observation time series of T, Td, and RH from yesterday to go with previous post.